When highways are built, they often cut through the bedrock, leaving rock walls along the margins of the road. 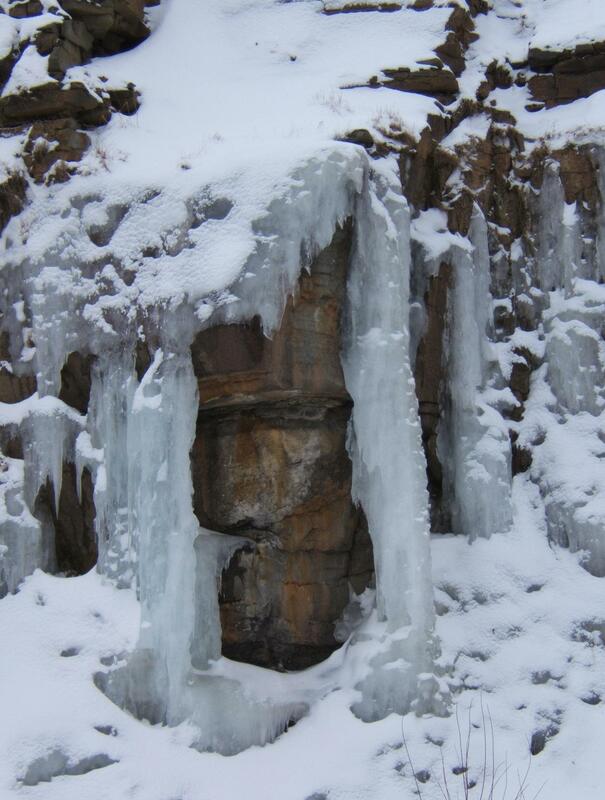 If these intersect a brook or seep of water, the result is a waterfall on the face of the rock. In spring or summer, rains can create wild cataracts. In winter the water freezes, building frozen walls of blue-shadowed ice. 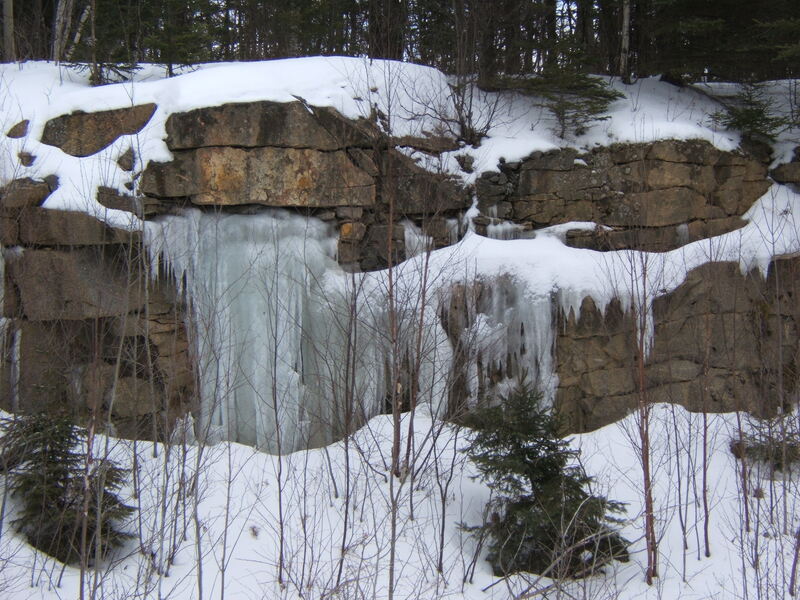 In sunlight, especially when they begin to melt, these ice falls are dazzling. As I approach retirement, I find I am thinking a lot about my past work. My first job was as a botanist in the field of air quality. 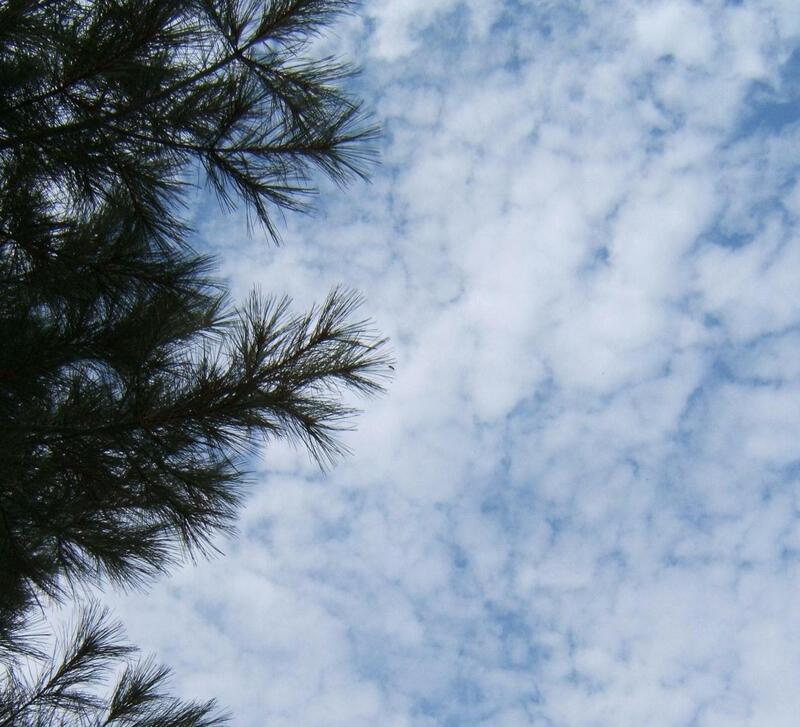 Some plants are very sensitive to air pollutants and develop ‘herring bone’ patterns on the leaves when the levels of pollutants like sulphur dioxide get too high. Other plants can be used as monitors since they absorb pollutants from the air. I worked to diagnose air pollution injury to sensitive plants and designed ways of using plants to assess air quality problems. We grew tobacco to measure ozone pollution, set out ‘tea bags’ of sphagnum moss to monitor levels of trace metals in the air, and collected reindeer lichens to determine their pollutant exposure. I had wonderful days identifying plants, collecting lichens and being a botanist. My favourite air pollution monitors were the reindeer lichens. These are like all lichens, a symbiotic organism consisting of an algae and a fungus. They have no roots, so they absorb all their nutrients from the air, making them an excellent monitoring system for air pollutants. They were a challenge to identify and the habitats where they grew took me to some very interesting places in New Brunswick. 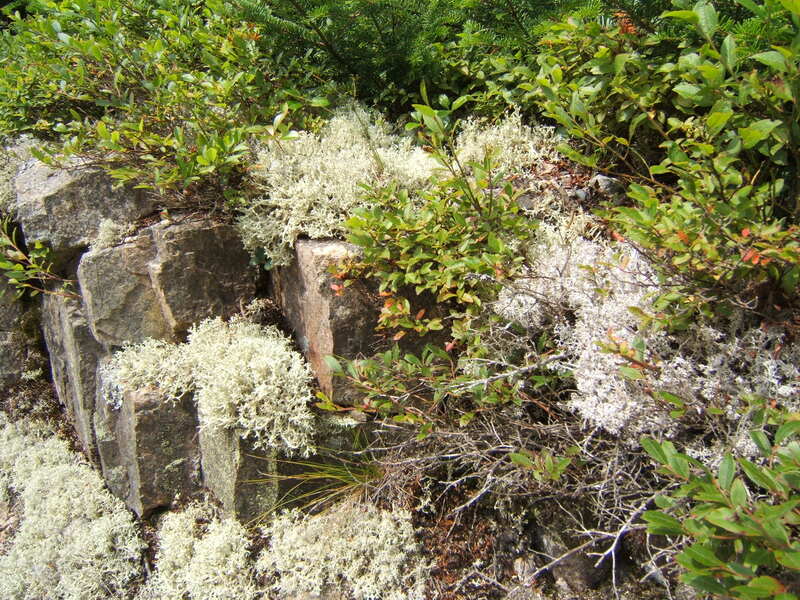 These included peat bogs where the lichens grew beside pitcher plants and sundews, mountain-tops dominated by ericaceous species like sheep laurel (Kalmia angustifolia L.) and blueberry, and high flung rock outcrops where I could see all the world below me as I picked my specimens. Although we collected many species, the three reindeer lichens most useful for our studies were Cladina arbuscula, Cladina rangiferina, and Cladina stellaris. These are all ‘fruticose’ lichens, species with a ‘shrubby’ appearance, consisting of a main branch with many side-branches. A single ‘plant’ fits nicely in your hand. The Cladinas all have hollow branches and could be (and are) used as little trees in HO scale train models. 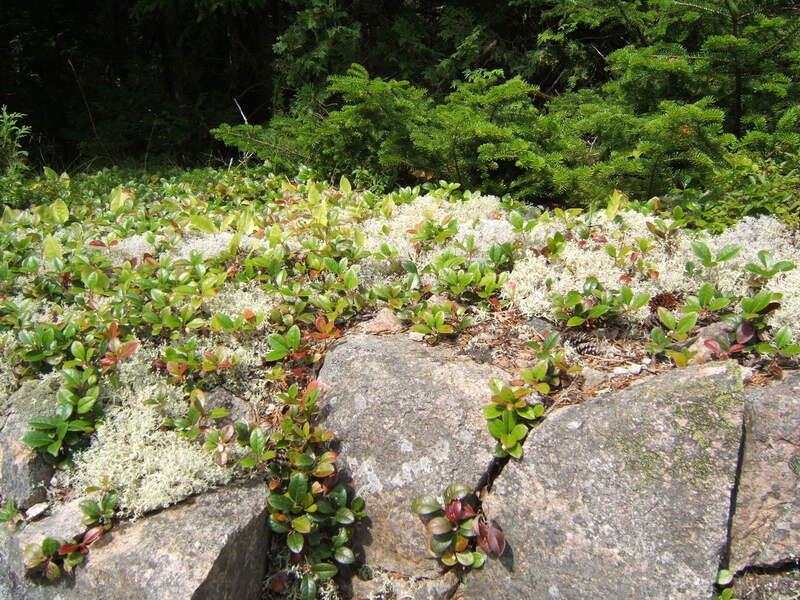 Cladina arbuscula (left) and Cladina rangiferina (right) growing on a rock by the roadside in Maine. You can tell the difference by the greenish color of the arbuscula and the bluish-grey color of the rangiferina. Cladina arbuscula (Wallr.) Hale & Culb. grows in extensive colonies, and is yellowish-green. The tips of the branches all point in one direction, a distinguishing characteristic of the species. Cladina rangiferina (L.) Harm. is often found growing with Cladina arbuscula and can be distinguished from arbuscula by its very blue-grey appearance. Cladina stellaris (Opiz) Brodo is yellowish-grey, and grows in distinct clumps which resemble small ‘poofy’ trees. Cladina lichens and moss on the rock at Moss Glen Falls in New Brunswick. The clump of lichen towards the center, looking like the ice cream in a cone, is Cladina stellaris. On our travels this summer, I reacquainted myself with the Cladinas. And I remembered all the remote places I have been as a result of my work. 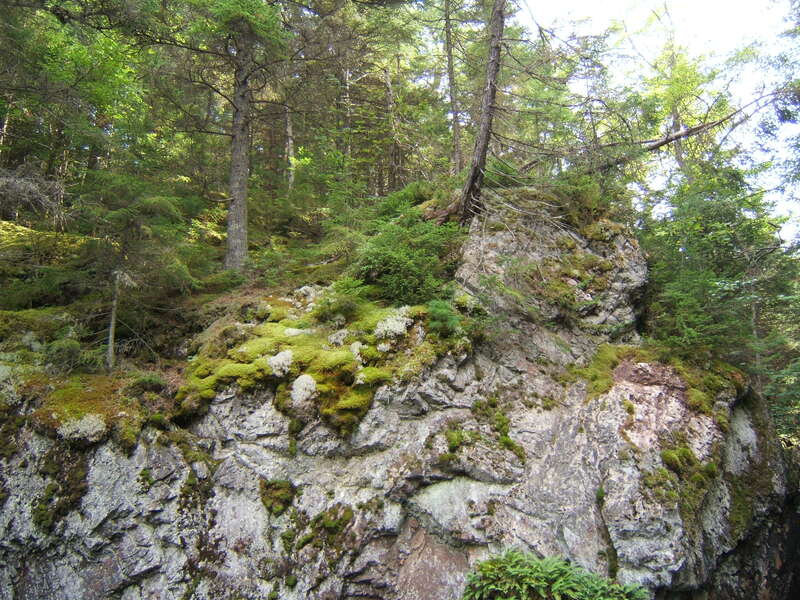 One of these was Turtle Mountain in southern New Brunswick, now protected as part of the Loch Alva Protected Natural Area (PNA). It is a very old mountain, worn to a granite hill. At the top of the hill, is an ericaceous meadow where Cladina lichens flourish. Earlier this summer, in July, we visited Little Sheephouse Falls, northwest of Miramichi. The Falls are part of the watershed of the South Branch of the Big Sevogle River. To see Little Sheephouse Falls requires a short hike through mixed woods. The trail to the Falls is very well maintained by the forest company who manages the area and was an easy walk in spite of my arthritic knees. The woods were green with ferns and other woodland plants. 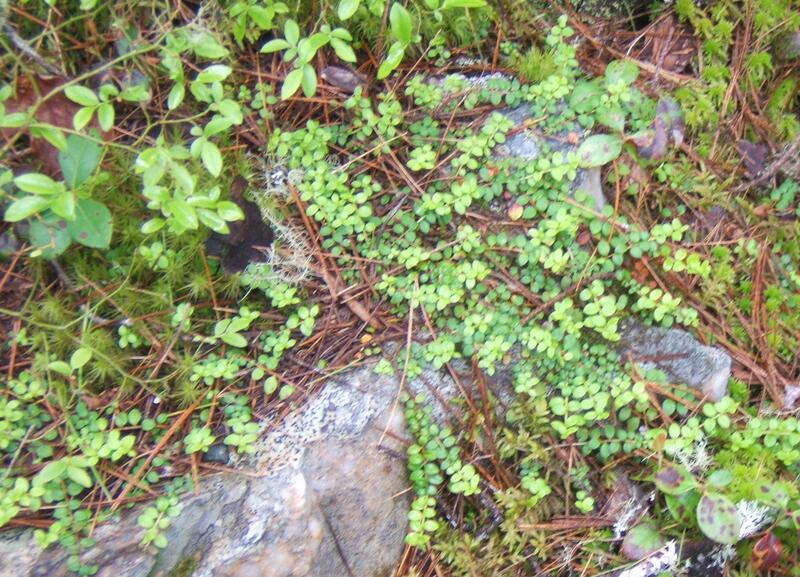 My favourite of these was a little vine of Mitchella repens L. cascading across a lichened rock. Commonly known as Partidge-berry, Mitchella is a small vine with roundish opposite leaves, often found growing in shady, mossy woods. It has pinkish flowers and small red berries. The Flora I consulted says it is found where it can be free from the competition of more vigorous plants. We did not go to the base of the falls, but kept to the trails navigating the escarpment. The falls are about 20 meters high, with a large pool and a cave at the base. They were a white torrent on the day we visited, making a rumbling thunder in striking contrast to the quiet woods. 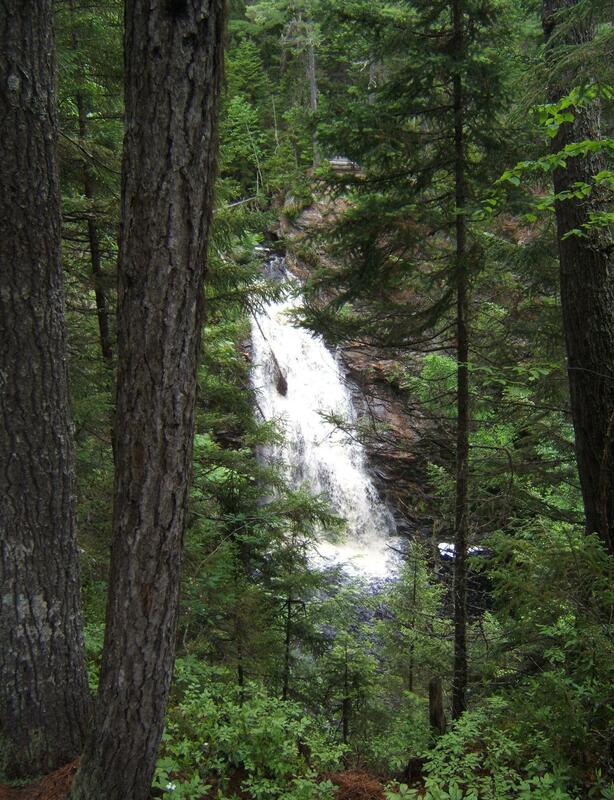 Directions to Little Sheephouse Falls, and other waterfalls in New Brunswick, are contained at Nicholas Guitard’s website http://www.waterfallsnewbrunswick.ca and in his 2009 book Waterfalls of New Brunswick (see ‘books about natural spaces’). Waterfalls are spaces to soothe the soul and inspire love for natural areas. They engage the senses… the sounds of the gurgling stream and the roar of the waterfall, the feel of cool, clean water, and the sight of water bubbling and boiling, following the contours of the landscape. Published as: “the three fates, spinning”, The Antigonish Review 165, Spring 2011. In July, we went to the Saint Martins area for the day and spent some time exploring the caves and beach-combing. We also took the short drive to the lighthouse at Quaco Head. 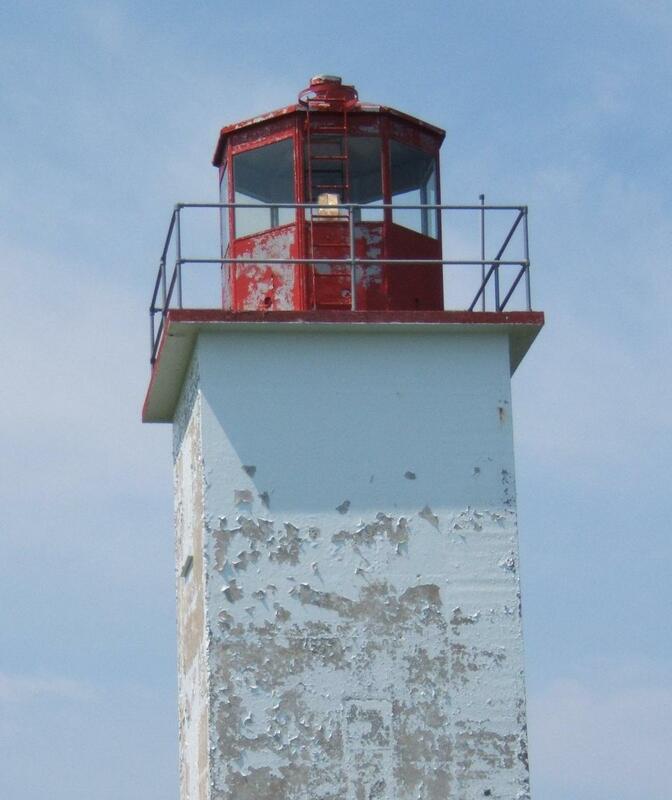 The lighthouse is perched on the cliff overlooking Quaco Bay. If you look out over the Bay, you can see some exposed rocks where sea birds make their home, and, to the north-east, Martin Head, about 30 kilometers away. Wildflowers were everywhere, but what caught my eye was a lichen on a flat rock at the base of the lighthouse. It was bright orange, like a splash of paint. 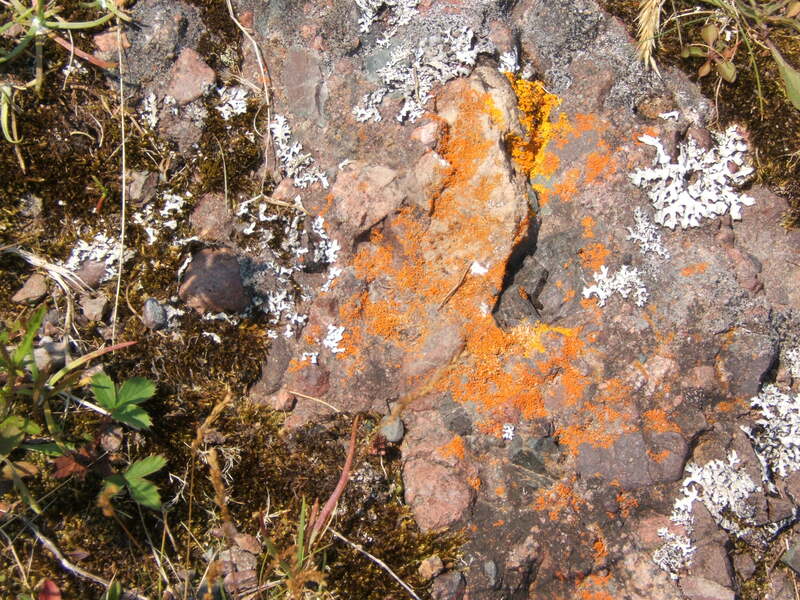 There are two orange lichens that live on rocks in the coastal area of New Brunswick, Xanthoria and Caloplaca. The orange lichen I found at Quaco Head is likely one of two species: Xanthoria sorediata (Vain.) Poelt or Xanthoria elegans (Link) Th. Fr. A lichen is not a plant, but a composite organism, consisting of an algae and a fungus, living together in a symbiotic, mutually beneficial, relationship. 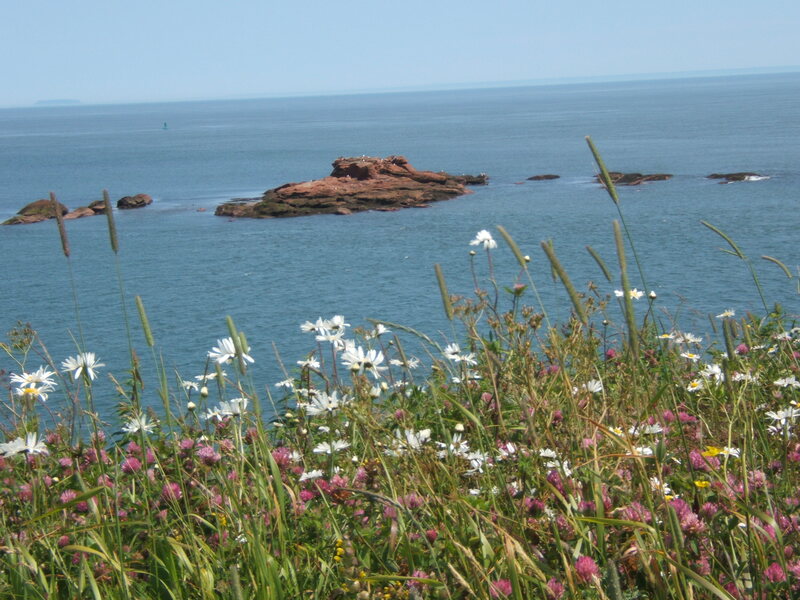 Every summer, we take a day to drive along the Bay of Fundy and explore some of the beaches and rocky shores. 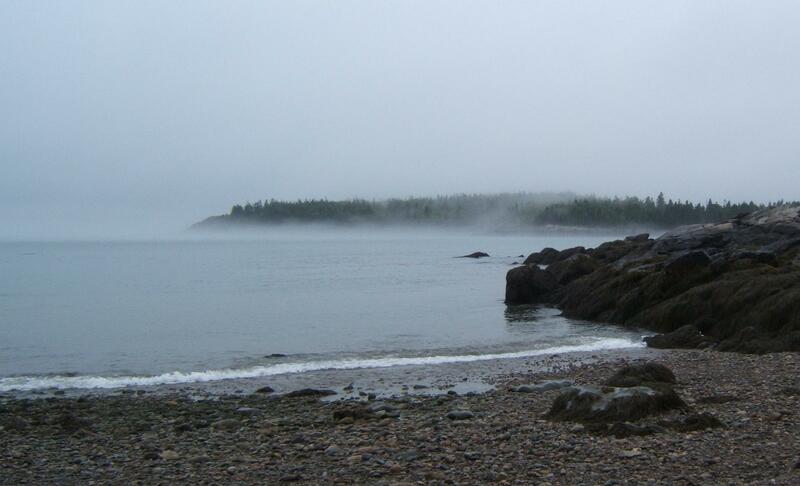 Last summer, we found a small cove where the fog was just lifting. Through the mist we could see the ghostly form of a fishing weir and the distant rugged shore. The beach was pebbles and sand, perfect for beach-combing. We wandered at random, watching for sea glass, shells and wave-smoothed rocks. The intertidal area, between low and high tide, is an extraordinary space, not quite ocean, not quite land. The plants and animals who live in this area have very particular ‘niche-needs’. They need the rise and fall of the tide twice daily. Some plants have adaptations to help them cope with changing conditions. For example, the brown algae Ascophyllum nodosum has bladders to help it float at high tide and reach the sunlight. When we explored the cove, it was low tide. Where the sea water was trapped among the rocks, there were tidal pools, small natural aquariums of sea life. 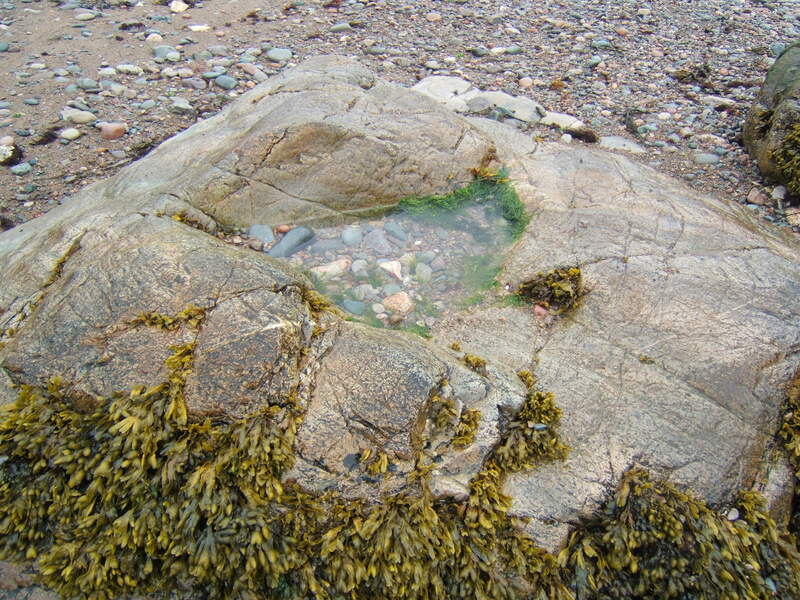 One rock with a large hollow in its surface had its own population of bladder wrack (Fucus vesiculosis), green algae (Enteromorpha), barnacles, and a lone crab. The barnacles are fun to watch. They are crustaceans, and live with their shells securely attatched to the substrate. An opening in the top of the shell is covered by a pair of ‘sliding doors’ called the operculum. Under water, the operculum opens and the barnacle reaches out with modified legs, designed to capture its food. The legs, known as cirri, look like feathery fingers, reaching out and pulling back, reaching out and pulling back. 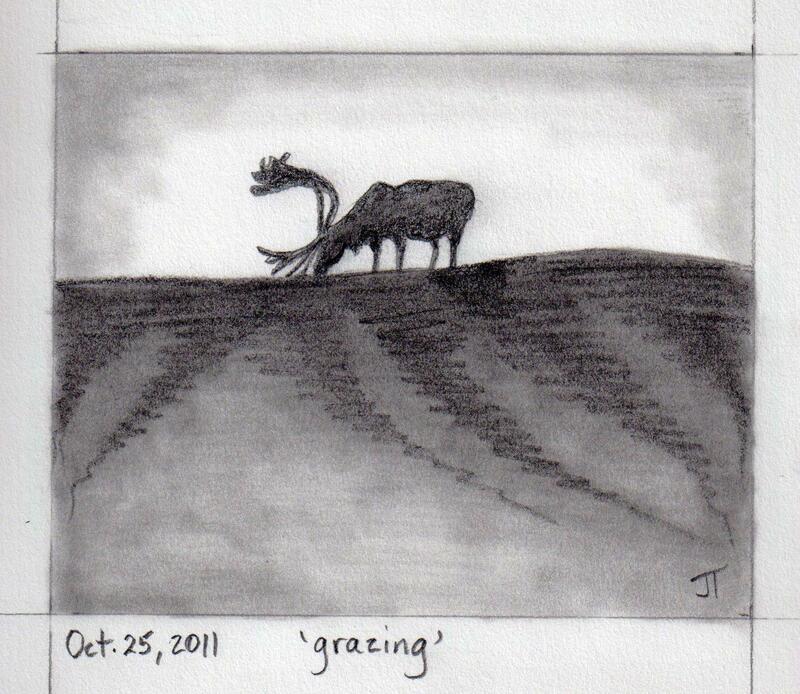 The ‘niche’ of a particular plant or animal can be thought of as its ‘occupation’ in the space where it lives. For example, with respect to food gathering, the crab feeds on the larger prey in the pool, the barnacles filter out the smallest creatures, and the algae take in their nutrients from the water itself. Although they live in the same space, the crab, barnacles and algae each occupy a different ‘niche’.